Pisces: New Moon in Gemini Tarot reading, 2017. Your dream world is real. Dance with love. Happy New Moon in Gemini, little fish. Pisces, on this new moon, I think you’re going to realize how much you’ve been getting in your own way. Please don’t tell me that the final zodiac sign, with all of the psychic power, has been denying themselves happiness. Please, don’t tell me that! Pisces, your first card out was the 2 of Cups reversed. Love has been a complicated part of your life lately, hasn’t it been? Love may seem like its just not in the plans, and not in the cards right now. Beloved, it seems this way because you have made it this way. The 2 of Swords, and the 8 of Swords following the reversed 2 of Cups tells me that you have been the one closed off to love. You are the one who has been terrified to feel. You are the one who has been denying yourself happiness and love. What are you so afraid of, beloved? Who have you been pushing away? Why have you been pushing away spirit? You know by now that it is a part of your life. Along with love. You cannot swim away from this. This is part of your identity. Yes, love and spirit. The Emperor firmly comes in as a reminder that although you are a water sign, little fish, you have an untamable fire within you. This fire is burning with passion and love. Within you Pisces, a very powerful lover exists. A person who is firm in their foundation, and knows their heart inside and out. In love, you do have the ability to lead, beloved. Why wait for someone to take charge, when you can first? The Ace of Cups is here to reassure you that love is still the answer. It is still a deep part of who you are. It is still what you want. Take charge over your emotions, beloved. The 4 of Swords reversed and the 4 of Pentacles as your outcome card is extremely powerful. You have three 4 cards. The Emperor, 4 of Swords, and the 4 of Pentacles. 4 denotes power, solidity, foundation, and security. With the 4 of Swords being reversed, it is time to get up, beloved. Wake up from your illusion of being powerless, or limited. You have an innate ability to exude power whenever you must. Not only are you going to finally wake up and realize how easily it can be for you to gain control over your life, but you are going to realize that you can have both your fantasy world, and your reality, all in one. You don’t ever have to stop loving or dreaming, beloved. You simply must learn how to incorporate the fantasy into the reality, and gain control over both as one. You are 2 fish in one body. You are duality. You are options. You are both the light, and the dark. The sacred, and the evil. The lover, and the fighter. You are everything in one. The Page of Pentacles as your energy card says that a new beginning or opportunity is going to present itself to you on this new moon. A new vision for your life is showing itself to you, and you must hold on to it, beloved. Dream again. Become inspired, again. You are starting a new chapter in your life, and it requires you to keep your spirits up. Get excited, beloved. Create a new vision board. It’s time to get back into the swing of things, and make some big fish moves. Nobody doubts you like you doubt yourself, Pisces. Have confidence in your pursuits. You do belong in this reality, and on this earth. You have every right to experience success in this world, regardless of how often you escape into your own world. Believe in yourself, beloved. Put your life first. Once you master thy self, love will feel less complicated. Dance with Luna tonight. She really does miss you. Tonight, admit that you miss her too. 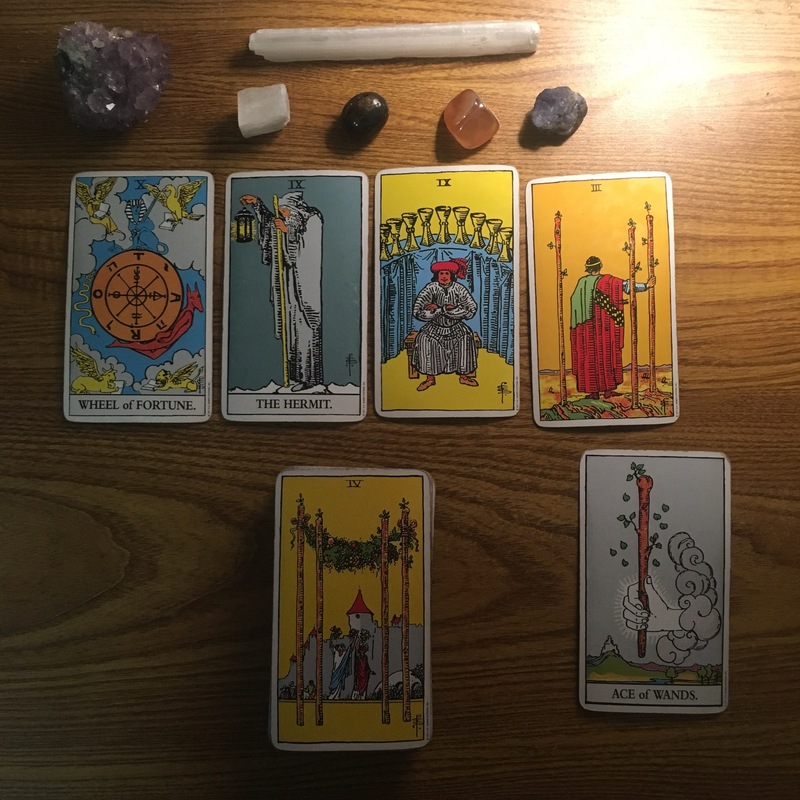 Previous Aquarius: New Moon in Gemini Tarot reading, 2017. Happiness is in the cards. Prove to us that dreams do come true. Next Libra: New Moon in Gemini Tarot reading, 2017. We all need you to be YOU, not your scales.